Bria is a recent graduate of Western Kentucky University, where she earned a Bachelor of Arts in photojournalism and sociology. She was the multimedia editor of the student newspaper, The College Heights Herald. 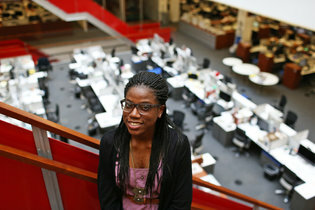 She has worked as a visual correspondent with USA Today’s Collegiate Correspondent Program. And she has completed internships at The Chautauquan Daily, in Chautauqua, N.Y., and The Anderson News, in Lawrenceburg, Ky. She is a member of the National Association of Black Journalists.